Non-contact interaction between two parallel flat surfaces is a central paradigm in sciences. This situation is the starting point for a wealth of different models: the capacitor description in electrostatics, hydrodynamic flow, thermal exchange, the Casimir force, direct contact study, third body confinement such as liquids or films of soft condensed matter. The control of parallelism is so demanding that no versatile single force machine in this geometry has been proposed so far. Using a combination of nanopositioning based on inertial motors, of microcrystal shaping with a focused-ion beam (FIB) and of accurate in situ and real-time control of surface parallelism with X-ray diffraction, we propose here a “gedanken” surface-force machine that should enable one to measure interactions between movable surfaces separated by gaps in the micrometer and nanometer ranges. Measurements of non-contact interactions between surfaces have always been a challenge. This includes the presence of a third body (e.g. liquid or gas) in the separating gap, with gap varying from micrometers down to the nanoscale. In the context of complex fluids, precise measurements between extended and curved surfaces have been done using the Surface Force Apparatus (SFA) [1–3]. In any environment, such as vacuum, gas and liquid, the measurement of interactions between nanoobjects has greatly benefited from the Atomic Force Microscope (AFM) [4–11]. Control and resolution in AFM interaction measurement has reached picoNewton scale in surface imaging under ultra-high vacuum. Cryogenic environment for single electron-spin detection even pushed the limit down to the attoNewton scale . The use of the plane–plane geometry for measuring nanoscale interactions remains somewhat as a dream as this is the simplest geometry used in many models. Indeed, this geometry enables exact calculations. In addition, flat surfaces are easier to control at the nanoscale (roughness, contamination, chemical functionalization, surface patterning). Measurements in the plane–plane geometry have been attempted in the framework of Casimir force studies, in order to probe the theoretical predictions of mechanical effects related to quantum vacuum fluctuations [2, 3, 13]. The limited accuracy obtained in historical Casimir force measurements based on macroscopic instrumental controls stresses the extraordinary difficulty of this sort of measurements (the reported agreement between theory and experimental data in  is ≈15%). This is mostly due to difficulties in controlling the parallelism of flat surfaces separated by gaps falling in the micro- or nano-range with enough accuracy. In contrast, measurements in the commonly used sphere-plane geometry [4–11] are in principle easier since a flat surface and a facing sphere do not need to be made parallel. However, interpreting such measurements immediately implies the use of the Derjaguin approximation, often referred to as the Proximity Force Approximation (PFA), whose validity has always been a matter of endless debates . Previous attempts of plane–plane interaction force instruments were closely related to the SFA [2, 3]. The misalignment between the planes surfaces was controlled using capacitive forces between two rotating metallic plates related to the samples. The precision allowed by this kind of set-up on the angle control was ≈2 × 10−3 deg . An unprecedented precision in the parallelism between plane surfaces has been achieved by the Nesvizhevsky’s group at the Institut Laue Langevin . During the measurement of the quantum states of neutrons in the Earth gravitational field, these authors were able to align two macroscopic planes (10 cm size) with an angular precision of ≈10−4 deg. However none force measurement set-up can be implemented in their experiment. In this paper we analyze how the combined use of (i) inertial motors for nano-positioning (translation and rotation), (ii) nano-tools such as FIB and (iii) X-ray diffraction on single crystal for real time, in situ alignment control can overcome the key difficulties in the design of a plane–plane Surface Force Machine (p2SFM). We shall see that: (i) inertial motors originally designed for low-temperature scanning-probe microscopy (SPM) (see e.g. [16, 17]) are used both to control and vary the distance d between interacting surfaces and their relative orientation (θ, φ); (ii) FIB is used to precisely weld a flat silicon single crystal at the extremity of an AFM cantilever and (iii) the sharpness of X-ray diffraction at Bragg position is sufficient to control parallelism and that it can be implemented so that this control takes place in situ and in real time. · Van der Waals and Casimir forces. with the Plank’s constant, c the speed of light in vacuum, and A the plate surface. In a recent paper  we presented a comparison between experiments and theory for the hydrodynamic force with perfect slip boundary conditions  between a flat AFM cantilever and a plane substrate. The cantilever oscillated in air while the plane substrate was approached from hundreds microns down to hundreds nanometers. The plane substrate was mounted over three linear inertial motors based on stick-and-slip technology allowing a millimeter range displacement (8 mm) with nanometer scale resolution (≈40 nm/step). The agreement between experiment and theory obtained solving Navier-Stokes equation together with perfect slip boundary conditions is 5%, when a residual misalignment of 0.7 deg is considered. The experimental set-up developed for the measurement did not offer any misalignment correction. However the residual misalignment between the two planes does not preclude a comparison between theory and experiment. This is because of the weak distance dependence of the interaction force in analysis. 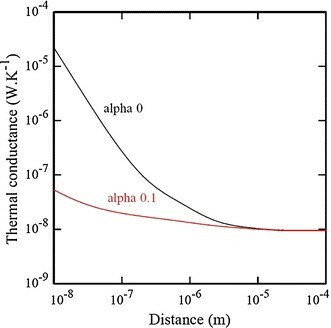 A simulation of the influence of the misalignment can be done in the case of the radiative heat transfer. We can consider, for example, the case of two flat surfaces of p-doped silicon (n ≈ 5 × 1018 cm−3) [21–23] and compute the thermal conductance between them as done in Fig. 1. We can see that a control in the parallelism much better than 10−1 deg is needed for a reliable comparison between theory and experiments at submicron scales. In the case of Casimir forces the required angle control is even more demanding. From Bressi et al. one sees that a precision better than 10−3 deg is needed for a comparison between experiments and theory much better than 15%. Such a level of accuracy cannot be achieved using a static experimental set-up as in the case of the hydrodynamic force measurement. An experimental set-up allowing for a real time in situ correction of the misalignment has to be implemented in the force machine. The level of precision needed for measuring interaction forces in the plane–plane geometry requires also a particular attention on the insertion of a force detection system into a plane/plane set-up with movable surfaces. In the case of sphere-plane measurements, this problem is generally solved by gluing a sphere at the extremity of an AFM cantilever [4–11]. In the case of the plane–plane geometry, we propose to use a FIB in the realization procedure. The FIB allows us to combine the need for a flat and lattice-oriented surface together with the insertion of a deformable lever mechanically linked with this oriented surface so that interaction forces can be measured. Thanks to a FIB equipped with an in situ micromanipulator, a cubic like block can be cut and extracted from a wafer and welded at the end of a cantilever (see figure 2: in this particular case the block has been cut from a Silicon wafer). In case of figure 2 the Silicon block has been welded at the extremity of a Au/Si3N4 -AFM cantilever in the so-called pendulum geometry. This is the geometry used for the measurement of near-field radiative heat transfer . For the measurement of the other interaction forces, the Silicon block should be welded on a side of the AFM cantilever, like it is nowadays done for the sphere in Casimir force measurements between a sphere and a plane [4–10]. During the positioning of the block, the precision in the angle that can be achieved is in the order of 0.1 deg. Furthermore, the block surface can also be polished using FIB to obtain a better quality of the surface (roughness less than 10 nm r.m.s.). It is known that a FIB treatment can induce surface charging. Although it should not be a problem for hydrodynamics, thermal transfer and even electrostatic measurements, this is surely unacceptable in a quantitative Casimir force measurement. In this case, gold metalization of the crystal surface will certainly be needed. The positioning obtained after the insertion of the two surfaces and the force measurement system is not better than 0.1 deg. This is not enough for interaction measurements in the plane–plane geometry. Beside changing and controlling the gap size, it is also necessary to change and control the relative orientation of the two surfaces. For this purpose, the two interacting surfaces are put on different mechanical stages that have to be approached each other. The approach can be performed using a linear translator based on inertial motors. To achieve the required precision in parallelism, a two-angle tilter system has to be implemented in the set-up. Micro-goniometers, that have been recently developed, allow one to adjust angle with a precision, at room temperature, better than 10−4 deg (see for example ). To control the parallelism between the two surfaces we propose here to use X-ray diffraction onto single crystals. 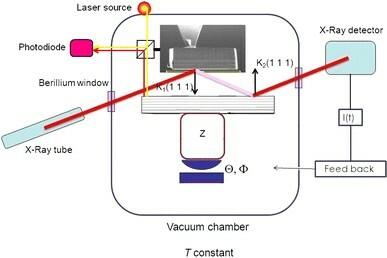 Let us consider the case sketched in figure 3: an X-ray beam can impinge onto the surface of the sample at an angle satisfying the Bragg conditions for diffraction. The X-ray beam diffracted by the surface presents the same characteristics as the incoming one, in terms of energy and intensity (for a single crystal thickness t > 50 μm the diffracted intensity is I D > 95% I 0 , with I 0 the incoming beam intensity; see ). 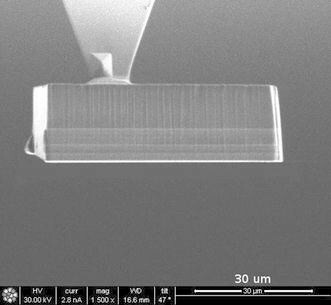 The diffracted beam impinges then onto the surface of the second sample. The beam is diffracted again only if the second crystal is orientated so that the Bragg condition is fulfilled. Considering the scheme in figure 3 we note that the second surface satisfies the Bragg condition only when it is perfectly parallel to the first surface (see below). This technique allows then to control the parallelism between surfaces by recording the evolution of the out-coming X-ray beam intensity as a function of the relative orientation (θ, φ) between the interacting surfaces. The out coming beam intensity reaches its maximum value when the lattice vectors of the two surfaces are parallel. Using a single information it is then possible to control both angles (θ, φ). The precision that can be achieved using such a control procedure is given by the Rocking curve of the selected materials. Let us consider for example the case of Silicon (3 3 3). For an X-ray beam energy of 24 keV the Bragg diffraction angle is θB = 6.7°. In figure 4 the evolution of the diffracted intensity as a function of the incidence angle is presented (the evolution of the X-ray diffracted intensity as a function of the incidence angle is essentially the same for (θ, φ) ). This is a regular and almost routine measurement at synchrotron facilities. The noise here is very limited (S/N in excess of 100 is generally observed in such measurements). The time measurement of the overall peak with about 30 points is 20 seconds, including the time needed for positioning. The idea here is not to measure the complete peak continuously but to stay at the fixed position where the intensity is half the maximum. 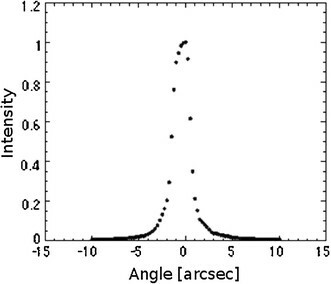 In that case, the angular precision is much better than 1 arcsec (figure 4), which is the angle variation needed to obtain an intensity change higher than half the peak height. From figure 4 we note that, considering S/N = 100, a precision in angle better than 10−5 deg can be obtained. Such an alignment procedure between two silicon single crystals is of common use for double crystal monochromator in synchrotron facilities. When the separation between the two surfaces enters in the micron and submicron range multiple reflections can undergo inside the cavity, thereby affecting the intensity of the outgoing X-ray beam. Considering that approximately 5% of the intensity is lost per reflection one should limit the multiple reflections within the order of 10 to maintain S/N in excess of 50 and not deteriorating the precision in parallelism. This gives a limit in the smallest attainable gap that depends on the surface size and the incidence angle. In the case of Si (3 3 3), with a surface size of 50 × 50 μm2, the minimum gap is in the order of 200 nm. Such value is the typical gap size attained for Casimir force measurements. It is known that a mismatch between the surface and the lattice axes can exist. The proposed procedure guarantees a very good alignment between the lattice axes that cannot be directly translated to a good surface alignment. Coupling optical reflection of a laser beam with diffraction of an X-ray beam will allow determining very precisely the orientation of the surface with respect to the lattice axes. Furthermore, and most important, if the two samples are cut from the same wafer the mismatch will be the same for both surfaces. Then, the good alignment of the lattice will be translated to a good surface alignment. It is worth noticing additionally that the proposed alignment procedure is very general and not limited to the alignment of two surfaces made of a single material. It is possible to cover a Silicon single crystal with a thin film (t < 1 μm) of a different material. A thin film is basically transparent to X-ray beams  so that diffraction occurs at the level of the Silicon single crystals. It is then clear that depositing films of different materials is possible without affecting the validity of the procedure proposed here. Due to temperature fluctuations, the two interacting surfaces continuously drift if there is no real-time control. The drift affecting the distance between the surfaces can be controlled using, first, temperature control of the whole experimental set-up, and, on top of that, real-time calibration using either electrostatic or optical measurements [1, 9, 10]. In this p2SFM an in situ real time optical interferometric measurement of the distance between the static lever basis and the movable single crystal must be implemented as shown schematically in figure 5. The drift affecting the parallelism can be controlled as shown in figure 5. A feedback loop acting on the goniometers can be related to the detected X-ray beam intensity. Maintaining the detected intensity constant ensures the real time parallelism of the two interacting surfaces. The precision in the separation and parallelism between two surfaces that can be obtained by the here proposed p2SFM will allow one to make a reliable measurement of the interactions between two plane surfaces. The precision in parallelism, in particular, is sufficient to measure also the interaction force that exhibits the strongest dependence on the distance, i.e., the Casimir force. As pointed out in the introduction, the use of the plane–plane geometry will allow avoiding using the Derjaguin approximation (PFA) made for the sphere-plane configuration . Using the here proposed p2SFM, it is even possible, in principle, to test the limit of validity of the PFA. Starting from the case of perfect parallel planes one can increase the misalignment angle and compare the experimental results with the theoretical model obtain in the PFA framework. It should then be possible to find a critical angle setting the limit of validity. In summary, we have first recalled the performances in orientation control that are required to perform interaction force measurements in the plane–plane geometry at the nanoscale. In order to reliably design a plane–plane surface force machine, we have then proposed an original combination of existing elements originating from different fields of instrumentation. The proposed force machine is sketched in figure 5. • A precise control of orientation based on X-ray diffraction on high quality single crystals that is routinely used at the required precision in synchrotron facilities. Although the set-up proposed here has not been realized and tested up to now, we believe that its design will give birth to a new generation of versatile and original force machines dedicated to the investigation on non-contact interactions between surfaces in the plane–plane geometry and at the nanoscale.